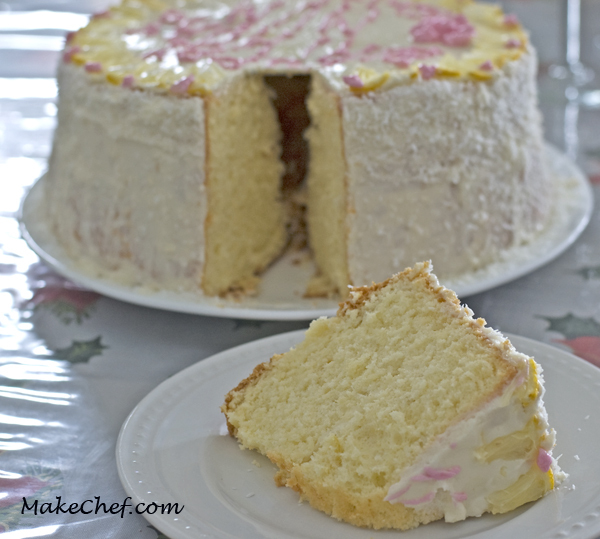 I very much enjoy the light and fluffy texture of chiffon/sponge cake. I usually make the Pandan version. This time, I wanted to try the lemon flavor. I absolutely love the outcome. It was the first time I baked a lemon chiffon cake. Shredded coconut was a perfect match to the lemon flavor. I coated the cake with a very thin layer of butter cream frosting in order to be able to stick the shredded coconut to the cake. It was simply delicious. Preheat oven to 350⁰F, rack in middle position. To prepare the egg yolk mixture, beat egg yolks with sugar in a bowl until mixture is pale yellow and fluffy. Add flour, baking powder, lemon juice and zest. Beat until combined. Add vegetable oil beat until combined. To prepare, the egg white mixture, beat egg white with sugar, cream of tartar and salt in the bowl of the stand mixer until firm peak is obtained. Gently, add half the egg white mixture into the egg yolk mixture to lighten the batter. Fold in the remaining egg white. Once the cake is cooked, invert the pan and let the cake cool down for at least 3 hours before unmoulding. This entry was posted in Dessert, Flour, Recipe and tagged cake, chiffon, lemon, sponge.